United Southern Artists, Inc. made the attempt to become one of the more successful independent labels, but in the end, nothing happened. To rockabilly collectors, United Southern Artists issued at least two interesting records that are now collector items. Billboard reported in its March 20, 1961, that United Southern Artists was founded on March 13, 1961, in Hot Springs, Arkansas. With Burton W. LeMaster as the president, the company served both as a record label and as a management firm for musicians and groups. A&R director became Carl Friend. United Southern Artists used the RCA custom pressing service for producing their records from 1961 on. The first known release of the label was Leo Castleberry's "Teenage Blues" / "Come Back to Me" (United Southern 5-101), which was picked up by United Southern Artists from another Arkansas based label called Spa Records. 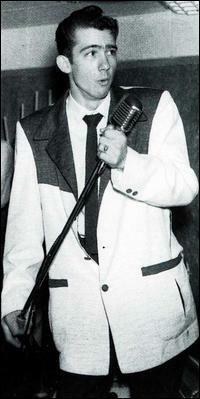 Castleberry recorded the songs in 1960 for Spa and the single maybe showed up the signs of success, so that United Southern Artists sensed a hit and took over the record. But the first success reportedly came with Hank Milton's release on the label. Milton, still a mystery to me, got some airplay on bigger radio stations KCUL (Forth Worth, TX), KDXE (Little Rock, AR) and KWAM (Memphis, TN) with "Gatling Gun" / "As You Were" according to Billboard. However, no Hank Milton appeared on the national charts. The record must have went nowhere. Milton, a member of the Big D Jamboree out of Dallas on KRLD, had another release on Wildcat ("Drop Me Gently" / "Where Do Dreams Go", Wildcat 0062). Memphis rockabilly star Eddie Bond also had one release on United Southern Artists in 1961 featuring "This Ole Heart of Mine" b/w "Second Chance", a country-rockabilly mix. Born in Memphis in 1933, Bond influenced by country stars Ernest Tubb and Roy Acuff. He began to perform locally as a teenager and after his stint in the Navy, he founded the Stompers (featuring a young Reggie Young on guitar). After auditions at Sun and Meteor, Bond found himself at Ekko and later at Mecury, where he recorded a slew of classic rockabilly songs. After his contract wasn't renewed, he cut singles for a a variety of small Tennessee and Arkansas labels. Another well-known act among rockabilly collectors are the Pacers, who recorded one single for United Southern Artists. The Pacers were the backing band of Sunny Burgess, who recorded on Sun from 1956 to 1959. Their recordings of such songs as "We Wanna Boogie", "Red Headed Woman" or "Sadie's Back in Town" are now rockabilly classics. After Burgess' last session, the band departed from him and Burgess went with Conway Twitty on tour. The Pacers went on the road on their own with a new front man and recorded "New Wildwood Flower" / "The Pace" for United Southern Artists in 1961. They went on to cut records for Razorback, another Arkansas based label, and recently reunited with Sonny Burgess. Today, Burgess and the Original Pacers continue to tour the worldwide rockabilly circuit with lots of success. 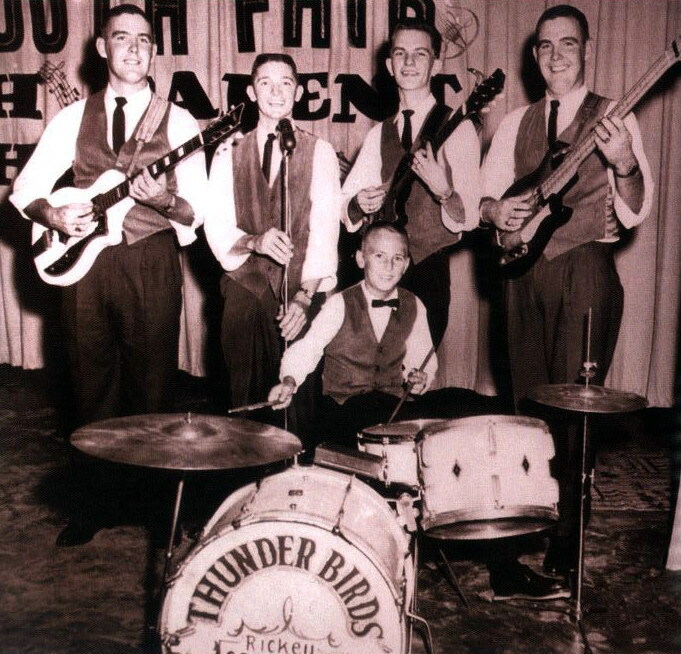 United Southern Artists 115 was by a rockabilly group called the Thunderbirds. Nothing is known about this band, but it appears probaly that it was the same band that recorded "Flying Saucers" / "A Whole Lot of Shakin'" for the obscure Buffalo label out of Monette, Arkansas. Both songs were covers of Billy Lee Riley's "Flying Saucer Rock & Roll" and Jerry Lee Lewis' "Whole Lotta Shakin' Goin' On". The Thunderbirds on United Southern Artists also recorded some unissued demos of rock & roll classics ("Blue Moon of Kentucky", "Ubangi Stomp"), but their single was comprised of the two originals "T Bird Rock" / "End Over End", two up-tempo instrumentals. Both groups may be the same, but there's no proof for this theory because virtually no information exists on the Thunderbirds. Although United Southern artists had some promising artists under contract and it seemed that this new label out of Arkansas could "make it" in the record business, nothing happened at the end. The label disappeared from the scene soon after these recordings were made. 5-131 – Walter Archie: The Joke's on You / ? 5-133 – Lance Roberts: It Was Fun While It Lasted / ? The A-Side is on Collectors CLCD 4418 track 3. Thanks Rocky! Your additions is highly appreciated! 5-111 Earl Grace : Christmas is just around the corner/ ? 5-125 The Ramblers : "Riverside Twist", "Lonely Senorita"
i believe some isuues are on u.s.a labels stamped? United Southern Artists 5-104 – The Uniques - Renegade/Malaguena 1961/Jun. 5 Bb rev. United Southern Artists 5-105 – Hank Milton - Gatling Gun/As You Were 1961/Jul. 24 Bb rev. United Southern Artists 5-106 – Eddie Bond - This Ole Heart of Mine (Clunch-Cantrell) (M8OW-8051)/Second Chance (M8OW-8052) 1961/Jul. 24 Bb rev. United Southern Artists 5-107 - Dave's Travelers - Traveler Rock/College Affair 1961/Oct. 9 Bb rev. United Southern Artists 5-108 – Beau-Hannon and The Mint-Juleps - It’s All Over (Jim Bohannon) (M8OW-8036)/Brainstorm (Larry Fity?) (M8OW-8035) 1961/Sep. 4 Bb rev. United Southern Artists 5-111 – Earl Grace - Christmas Is Just Around the Corner (Earl Grace-Stan Kesler)/? 1961/Nov. 27 Bb ment. United Southern Artists 5-112 - The Pacers - The Pace (Quachita, BMI) (M8OW-8403)/New Wildwood Flower (Quachita, BMI) (M8OW-8402) 1961/Dec. 18 Bb rev. United Southern Artists 5-113 - Ray Mitchum - Stood Up Again/I Can't See 1961/Dec. 25 Bb ment. United Southern Artists 5-115 – Thunderbirds - T Bird Rock (Davis-Wiemers-Haffron-Garrett) (M8OW-8397)/End Over End (Davis-Wiemers-Haffron-Garrett) (M8OW-8397) 1962/Jan. 27 Bb pop rev. United Southern Artists 5-116 - Ricky Durhan - Raining In My Heart/? United Southern 5-119 - Russ Elmore - Black Gold/? Some copies of these have SPA crossed over and stamped with United Southern Artists. Dale Fox (with the Gene Lowery Singers): It Can't Be True bw Call Me Again. Both were written by Carl Friend and Dale Fox. Thank you very much Ken, your additions are always highly appreciated! I have incorporated your information, exept for #107. As you noted, I also list "Movin'" as the flip side. Your mistake or mine? My listing for #107 agrees with your listing - Traveler Rock/Movin'. Anonymous listed another flip, "College Affair" as the flip to Traveler Rock. I was agreeing with you, but perhaps the one he lists is an alternate flip. United Southern 6-102 "Curley" Williamson, The Creator & I Know. 5-131- Walter Archie: The Joke's On you/?????? Great information on this label.I just recently found a 45rpm on United Southern by The Galaxies.Good stuff.